CSLB has a new way to report illegal advertising activity to help level the playing field for licensees. 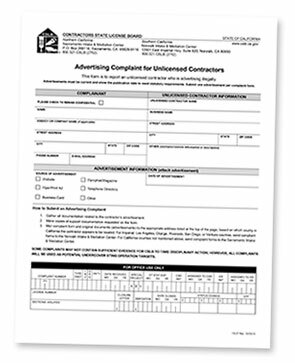 An Advertising Complaint form now is available on the CSLB website to report unlicensed operators who illegally list their services on the Internet or in publications, in defiance of state contracting law. Licensed contractors must include their CSLB license number in all forms of advertising. Those without a license can advertise as long as the ad states that they are not a state-licensed contractor, and the combined total of a project's labor and materials costs is $500 and under (Business and Professions Code section 7027.1). Licensed contractors who encounter an ad they think was placed by an unlicensed operator can go to www.cslb.ca.gov/Resources/FormsAndApplications/AdvertisingComplaint.pdf. The reporting service also is open to consumers. Anyone who files a complaint can remain anonymous. Download and print the online PDF form, specify the source of the ad, and attach a copy that shows the ad publication date. The form must be mailed to either CSLB's Sacramento headquarters or the Norwalk Intake & Mediation Center. Instructions about which office to mail the information to are included on the form.